Normal earphones have the tendency to get tangled easily, especially when they are not connected to the phone or mp3 player (nicely coiled and/or corded up). It’s a mess having to just rummage through a vast bag, and a torture having to untangle the wire (especially when you are up and about in a crowded place). Even when the wire is nicely (as much as possible) coiled around the phone or coiled inside a case, it is a nightmare having to uncoil it (holding on to both phone and bag) on a crowded moving bus or train. 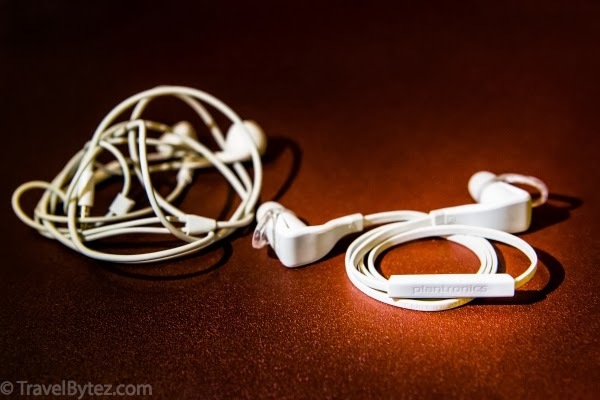 While you have music piped into your ears, you are still subjected to the constraints of the (slightly short) wire getting in the way (dangling from the ears all the way to the bag or pockets) and risk any device connected to it to accidentally drop. Take out the Plantronics Backbeat GO 2 Wireless Earbuds from bag / casing. Connect the earbuds to the music device via Bluetooth and you are done!